Contact: 16 C Victor Sq. Jennifer Ashby has been playing in the kitchen for as long as she can remember. While her mom used to make chocolates during the holidays for family and friends, Jennifer stuck to baking until she attended the Culinary Institute of America for Baking and Pastry at age 26. It was there that her love for working with chocolate was born. She has always been a foodie and loved to share the fruits of her labor. 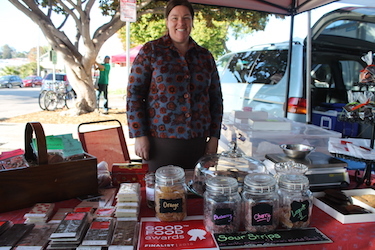 With her new found love of creating chocolate, caramels, marshmallows and fruit candies, she took on the challenge of creating confections using the finest ingredients, many of which were grown or produced right here on the central coast. Ashby Confections is a small artisan company committed to making handmade chocolates and candies using traditional methods and high quality ingredients, many of which are organic. They are committed to using sustainably grown and purchased fair trade/direct trade chocolate, organic dairy products and local, organic fruits, flowers and herbs. On most days one can find the staff at Ashby Confections making small batches of fresh chocolates and candies as part of the kitchen is open and visible to the community. Ashby Confections is a place to find handmade fresh truffles, flavored marshmallows, caramels, chocolate bars and 'pates de fruits' featuring fresh, local fruits. Using traditional methods and contemporary techniques, they make their chocolates delicious to the eye and the palate. Their confections are great for a small indulgence or a gift to yourself or someone special. They have a variety of elegant packaging to suit any need. Jennifer encourages her staff to be creative and not only make things that she has created, but to also try out their own ideas. Ashby Confections is very inspired by all that this region has to offer. While living in place of such rich agriculture, they highlight the local farmed commodities and artisan products in their confections. Jennifer has been committed to using Clover Organic Dairy and all of her chocolates feature organic, direct trade Askinosie chocolate. She shops at the Farmers Markets frequently for seasonal produce that could be incorporated into her chocolates and candies. Farmers Markets helps to support the local economy while making her products stand apart.